“I HAVE A PARTICULAR FONDNESS for the work of Louis Morales and his painting, Bogue Falaya Park Looking Across the River. The paint is very rich in color and texture. I think his style is distinctive, even when he paints a subject that may have been painted many times by others. I like the specificity of knowing that this location, very near to me, inspired his process,” says Tim Lantrip. Tim is an experienced businessman who oversees operations of the English Tea Room and Eatery. His wife, Jan, is one of only five compounding pharmacists in Louisiana. They are great storytellers—and attentive listeners. Each makes generous use of narrative traditions to illustrate, educate and advance advocacy for the cultural arts in partnership with local business and government. Tim is a natural communicator. He relishes bouncing ideas around in casual conversation, beginning with a story. “When the Eiffel Tower was proposed for the 1889 World’s Fair (Exposition Universelle) in France, there was concern expressed by the people of Paris about the unique character of the design. The tower appeared to some to be lacking harmonious qualities in keeping with the architecture of the day. Because of this resistance, Gustav Eiffel proposed a temporary structure that would come down after the World’s Fair ended. The response to this vision of the future was eventually so favorable that the Eiffel Tower stands as one of the most recognized landmarks in the world,” he says. “We know Covington is not Paris, but we are not without our landmarks. The most obvious is our old water tower. Many communities divested themselves of these when new water towers were built. Lighting the tower would highlight the structure and demonstrate our commitment to historic preservation.” As these light projects extend into public art, the community at night becomes an attraction in itself. It is not only inner strength and wisdom that comes to light in conversation with Jan, but also a desire to help others. The example set by her mother and a keen interest in science led her to her degree in pharmacy. She worked for years in the same pharmacy in Hammond until the death of her mentor and friend. Today, Jan works as pharmacist 12 hours a day, three days a week. Other days are devoted to the English Tea Room and her passion for the universal appeal of tea in all cultures. An important, and sometimes overlooked, ingredient in the creation of a vibrant culture is one the Lantrips live with every day. 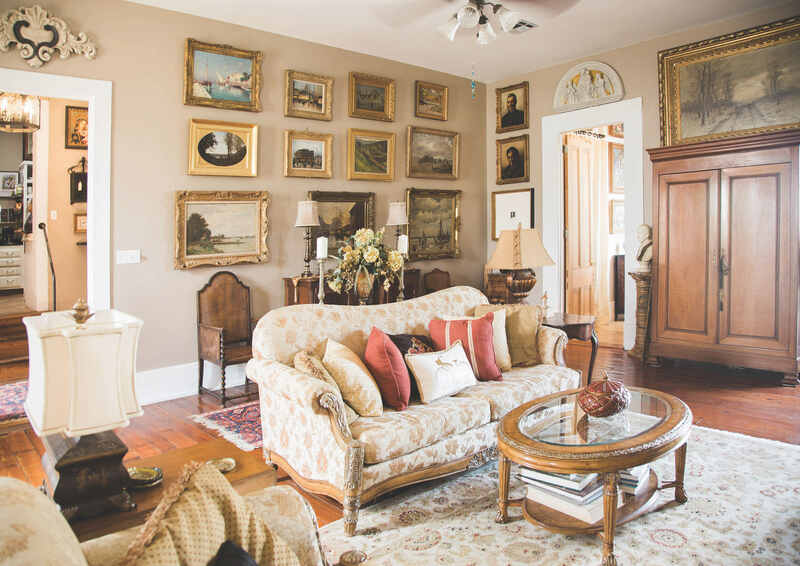 They are collectors and patrons of the community of visual artists and arts organizations in Southeast Louisiana, with a special emphasis on St. Tammany Parish. Their collection is displayed throughout their home in the tradition of collectors who not only love the objects they collect but also develop relationships with the artists who make them. Tim says that growing up, he did not focus much on the arts. He makes the point that sometimes people hesitate to purchase art because they are not very sure they understand enough about it. “My first notion as a young person was that art must be the Elvis paintings on velvet I saw on the side of the road. It was not until I moved to the Houma-Thibodaux area and attended Nichols State University that I experienced my first glimpse of the great big world of art making. As part of the core curriculum, art appreciation was one of my required classes. In collecting, serendipity is part of the fun. “You have to be willing to make some missteps, but also embrace the surprising moments when you stumble onto a treasure. I once purchased a Jackson Pollack drawing at a country sale that was discovered in the wall of an old house. No one really knew who Jackson Pollack was. I liked the drawing, but I had no idea it was authentic at the time.” Another time, Tim noticed a particularly interesting frame he thought he could surely use. “Later, I discovered that the George Washington print in the frame was part of a very small print edition, definitely more valuable than the frame.” Occasions such as these amuse him, adding to his enjoyment of the journey.